Chinese wedding dresses... what is meant by that? This is referring to bridal gowns you can buy direct from China and are sold on eBay and on the web... a good deal? No doubt you have come across websites and sellers on eBay who sell wedding dresses directly from China. Should you consider buying one of these wedding gowns? These are popular with brides because they are cheap. How can you be sure that the gowns sold on the web and eBay at incredible prices will meet your expectations? Read the tips that follow. Go to this article for tips on ordering eBay wedding dresses made in China. Chinese Wedding Dresses: What Issues Might You Find? Now I am not saying that the following is true of all wedding dresses sold direct from China. But these are some things you need to be aware that could occur when purchasing a wedding gown this way. There are a few issues that tend to come up with these dresses I have read about on wedding boards and forums. Interestingly, these same issues I have come across when brides bring in gowns they ordered direct from China to be altered. Determining the color of the details on the gown has been a problem for some brides. In the cases I personally know about, the color of the dress was not the shade the bride expected. One bride thought she was getting a white dress with red embroidery design details on it. That’s what it looked like on the computer screen. What did she end up with? "A white gown with hot pink embroidery!” She had to then change her flowers and other decorations for her wedding so that it would not clash with her dress. “Imagine the trouble that would cause if it happened to you! Another bride I worked with had to have them send her another dress because the color of the first dress was a rust color, instead of the burgundy color she expected. If you don’t take correct measurements, and order your gown using the sizing charts, then there is a good chance your dress could be several sizes too small. the charts are hard to understand. When ordering wedding gowns direct from China. please make sure you order the right size. It is better to order it too big than too small. It is easier to take a dress in than to let one out! Another problem is the cut of the bust area. It appears that on some gowns, the bust area is cut smaller than normal. This is a complaint I have seen on wedding forums by some brides, especially from some plus-size brides. The gowns I have worked with seem to be designed more for an A to B cup individual. So if you are a B cup or larger. . . you might find that the neckline on a strapless wedding gown will not be high enough. This has been my experience with brides and bridesmaids dresses. The inside construction has only four pieces of boning. Sideseams are sew incorrectly." 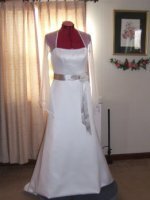 Some of the Chinese wedding dresses sold on the web direct from China I have worked with lacked the linings and inner structure needed to provide a smooth finish while wearing the gown. The fabrics the bridal gowns are made from are not up to the quality of the typical designer wedding gowns. The linings are extra thin and in some cases so thin that you can see through them. Most brides don’t realize that the lack of proper structure will cause problems with the fabric of a bridal gown not laying smoothly on the figure. But they soon find out. When is that? When looking in the mirror, during a fitting, they notice wrinkles in their dress. They ask me if they can be ironed out or altered. At this point I have to let them know that because of the fabric and/or construction, nothing much can be done. Some of these manufacturers say they can design the gown of your dreams. Be careful. I have seen simple additions such as sleeves added, not come out correctly. I would be a little apprehensive to have a whole dress designed this way. It is best to get someone you can go to directly to have a custom made wedding gown. This way you can have the necessary fittings and see the design as it progresses. 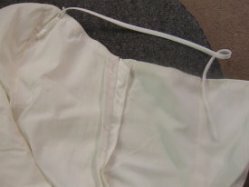 Some of the gowns come in with stains that need spot cleaning. Brides have complained of unpleasant odors. I myself have experienced this when altering gowns. The fabric has to be delinted of tiny fibers that discolor the gown. The zippers on some split apart when tried on. It was an unnerving experience for me when I started steaming a gown and all the marks from a purple marking pen popped back up. I am finding out that some Chinese wedding dress wholesaler companies are seeding their sites with reviews and placing phony ones on other review sites. They try to submit promotional reviews to this website. When detected, I don't post them. Some that get through and are posted and are later discovered to be fakes, I leave it up and update the review, noting the fact. This way you will know which companies you should do business with and which you shouldn't. I hope this will discourage companies from posting fake reviews on this site. There are companies out there that can deliver a good quality wedding gown. You have to do your research in order to find them. Google search the "company name + reviews", to see what comes up. This can be a big help in your making your decision. You certainly can save a lot of money buying a dress this way. But make sure you are getting the best quality dress you can for your money! Special Note: After I had finished up this page I came across this information someone else had written about eBay retailers of China made wedding gowns. I feel it is informative and something you should read before you purchase a gown this way. Click here to read this article. For some brides they may feel it looks close enough to the dress, so it may not be a big deal. But if you are one looking for the exact quality you saw in the bridal shop, you would might not be happy with the gown. Have you bought a wedding dress direct from China from an Ebay store or on the web? What was your personal experience ordering this way? We would like to hear from you the good, the bad, and the ugly. Please share your thoughts! Your story will appear on a Web page exactly the way you enter it here. You can use html code if you are familiar with it. Make sure the picture is no larger than 500 x 700 pixs.